Suzanne Elledge Planning & Permitting Services, Inc.
8 am - 6 pm Mon. 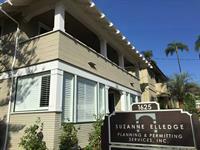 - Thu., 8 am - 12pm Fri.
Suzanne Elledge PLANNING & PERMITTING SERVICES, INC. has provided professional planning, land use consultation, permit processing, and project management services to a wide variety of public and private sector clientele throughout Santa Barbara County since 1994. Our firm is widely recognized for taking a creative and respectful approach to guiding projects through the public review and entitlement process. We have extensive experience representing a diverse range of residential, institutional, and commercial projects and we have earned a reputation for successfully integrating the objectives of our clients with the community?s planning policies. Our professional staff provides unsurpassed quality of service at competitive rates. Our enthusiasm for facilitating successful permit acquisition and our reputation for providing superior, personalized service have been leading factors in our steady growth over the past 20+ years. In addition to the expertise provided by our own staff, we have an excellent working relationship with dozens of public sector employees and an extensive network of professionals in the fields of engineering, surveying, architecture, landscape architecture, and environmental consultation. Suzanne Elledge PLANNING & PERMITTING SERVICES, INC. provides full-service support through the entitlement process from project concept through approval, which includes the following: Land Use Consultation, Permit Processing, and Project Management.